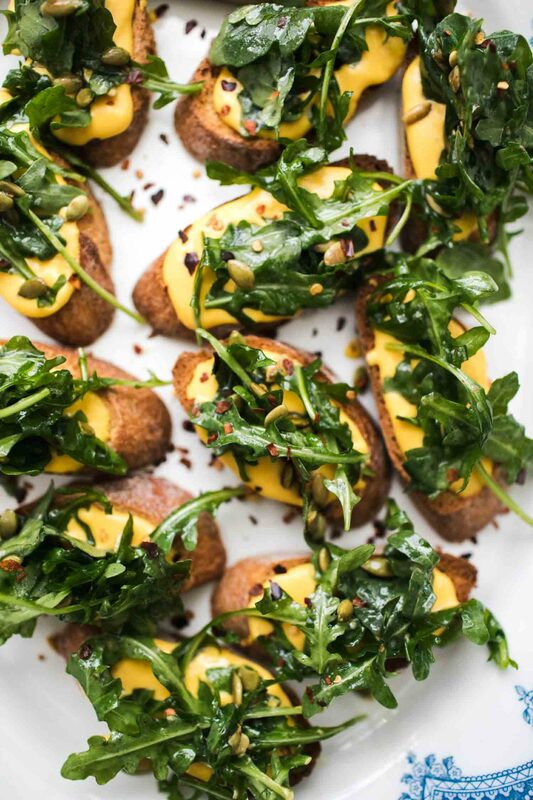 Pumpkin Ricotta Crostini with Arugula | Naturally. This recipe is in partnership with Nugget Markets. See below for more details. I don’t get to cook for people as much as I would like. There’s something about the energy that comes from sharing food with others. It’s an easy way to bring people together, especially during the holidays. While I typically focus on the main meal, I have a not-so-secret obsession with small bites and appetizers. Give me a solid cheese tray or a plate full of crostini any day and I’ll be happy! This year, I’m partnering with Nugget Markets to bring you these lovely pumpkin ricotta crostini. 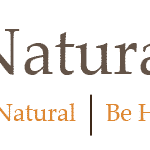 If you’re in the NorCal area and looking for the perfect place to stock up on food for the holiday, Nugget is your go-to place. I personally go for the cheese and wine but there’s so much more (like all the ingredients for the recipe)! The best part about these crostini is that the ricotta mixture can be made ahead of time, making fast work of assembly of these beautiful crostini. The creamy ricotta and pumpkin plays perfectly with the peppery arugula and crunchy pepitas. You can also make these gluten-free- just use your favorite gluten-free bread! 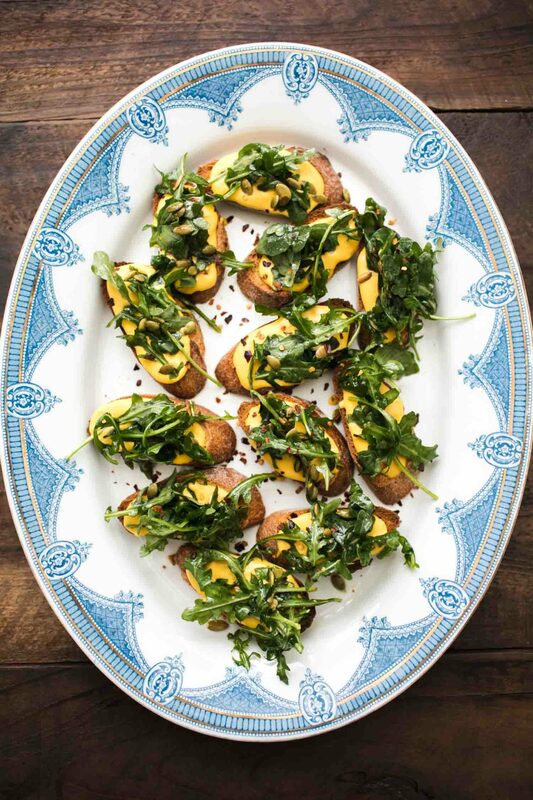 A perfect fall party treat, ricotta is whipped with pumpkin puree and topped with a simple arugula pepita salad. Heat oven to 425˚F. 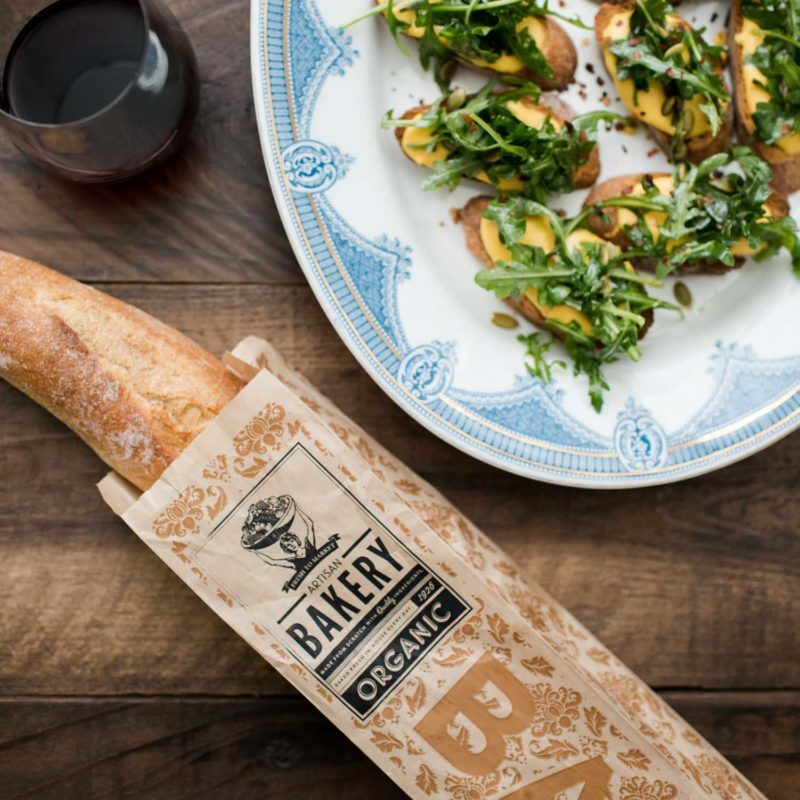 Place the pieces of sliced baguette on a sheet pan and brush with olive oil. Bake until lightly toasted, 10 to 12 minutes. Remove from oven and rub each piece with the cut side of the garlic. While the bread is baking, combine the ricotta with the pumpkin puree, maple syrup, salt, and pepper. Whip until mostly smooth. Alternatively, if the ricotta is a bit gritty, whip in a blender. Place the arugula and pepitas in a bowl. In a small jar, combine ingredients for dressing and shake until combined. Pour over the arugula and toss until the leaves are coated. Assemble the crostini by spreading the ricotta mixture on each piece of crostini. Top each with a bit of salad and finish with a sprinkle of chili flakes. Tips & Tricks: Want to take these a step father? Try making your own homemade ricotta. It doesn’t take much and is one of the easier cheeses to make at home. These crostini can easily be adapted for your taste. I love pumpkin puree but during this time of year finding pumpkins and/or the puree can be a bit tough. Also, cater to all your guest by making them gluten-free or vegan. Squash: Swap the pumpkin for sweet potato, butternut squash, or acorn squash puree. Vegan: Swap the ricotta for a tofu-ricotta (like this recipe). Greens: Arugula can be a bit peppery and overpowering. If you’re not a fan, swap for shredded spinach or massaged kale. One of my favorite things to do in the fall is make homemade pumpkin puree. The flavor has an edge on the store-bought version and you get the added benefit of having toasted pumpkin seeds. Of course, you can always pick up a can at the store- recipes that use pumpkin puree can use homemade or canned! Disclosure: This recipe was created in partnership with Nugget Markets. All thoughts and opinions are my own. It’s content like this that helps me keep this site running to provide the vegetarian recipes you see every week. I don’t make crostini enough, so I’m really looking forward to trying this over the weekend!